Based on chord symbols in a tune's main voice MusiCAD will add an automated bass line ''automagically". By default, an auto-bass-line is kept invisible and will be regenerated from the main voice just before playback. Automated bass lines will not be stored within a tune but be regenerated from the chord symbols when the tune is opened once again. The automated bass line and automated chord line complement each other. As soon as an automated part is edited, it will become static. To be able to view or edit an automated bass line you have to make the part visible in the score dialog first using the eye-button while the bass line is selected like below. 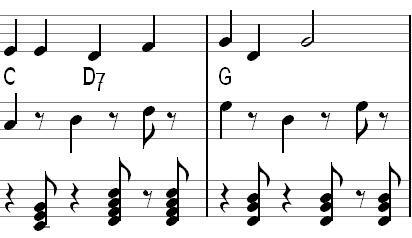 In 4/4 meter the chords from the first voice will produce the bass and chord line as notated above. The same piece will render differently in 8/8 meter. 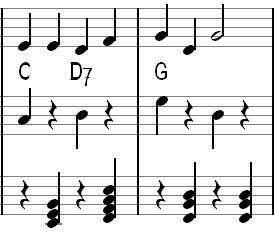 The used notes are made up from the chord notes: on the first beat the chords fundamental is used, alternating beats will be quarter below the fundamental and alternatively a third above, limited by settings in the arrange dialog. Seventh chords will use it's third predominantly.